Dave Brown with his two medals at the World Indoor Masters Championships in Poland. The classy Nene Valley Harriers veteran, who ran a new indoor PB of 50.36 to land the bronze medal in the Over 40 400m early in the week-long event, finished with another bronze medal in the 4 x 200m relay. Although the flying 41 year-old is a specialist sprinter, he occasionally dabbles in the 800m, and he did so with great effect in the championships, running a new indoor PB of 2:03.12 and only just missed out on making his age group final. “I was confident of running well in the 400m,” said Brown. “Winter training had been very solid with no injury issues and an indoor PB was the aim. “If I medalled then great but the time was the main thing. I was only fourth fastest on paper so was being realistic. “The good lane I had in the final, which was a reward for qualifying as a heat winner, certainly helped. “I knew I had a better time in me than the heat time of 51.61 suggested as that race was a hard-fought battle with the American Antwon Dussett (a former world champion). There were some minor feet clashes which knocked my rhythm. 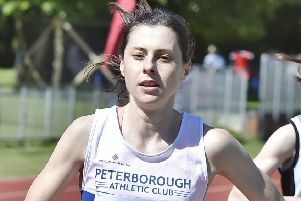 Brown plans to compete in the European Veterans Championships outdoors in Venice this summer, and should prepare well as the Nene Valley track and field team will again be competing at a high level nationally. Another veteran from Nene Valley Harriers, thrower and club chairman Tim Needham, interrupted his Australian holiday with a gold medal winning performance in the New South Wales Veteran Throws Pentathlon. Better known these days as a coach of the burgeoning Nene Valley sprint squad, the versatile 66 year-old still keeps himself in good nick. Needham’s back-garden throwing practice caused some consternation recently when he sheepishly had to ask for the discus back having launched the projectile into an old people’s home adjacent to his house! Needham’s best efforts were: Hammer 29.24m; Shot 7.59m; Discus 29.32m; Javelin 18.78m; Weighted Throw 10.51m. There were wins galore for Nene Valley youngsters in the midweek Corby Open Meeting. Toby Staines won the Under 11 150m in a time of 25.1, while his older brother Sam was first in the Under 17 600m with a 1:30.9 clocking. Under 13 Evie Hemmings won the 1,000m in 3:32.6 with sister Lottie clocking 7:43.8 for first place in the Under 15 2,000m. Andrea Jenkins began the outdoor season well at the Kettering Throws Open meeting. The Nene Valley Harriers ace was first Over 40 in all four disciplines and first overall in the hammer. Kelly Lawrence finished second to Jenkins in the hammer. Peterborough AC youngster Luke Phillips was second in the Under 17 discus and third in the javelin and shot. Andrea Jenkins - Shot 9.31m; Discus 34.96m; Hammer 43.11m; Javelin 20.79m. Kelly Lawrence - Hammer 40.14m. Luke Phillips - Shot 7.23m; Discus 20.14m; Javelin 18.98m. Werrington Jogger Jack Green pulled off his first ever race win in the Living Sport Peterborough 10k at Thorpe Meadows on Sunday. Green clocked 36.44 for his victory. Michael Branston of Yaxley finished sixth in 40.53 with Bushfield’s Adam McCluskey 12th with a 42:14 clocking. Chris Orchard of Peterborough AC finished 13th in 42.3 and Sue Harlow of Yaxley clocked 47.03 to come home as second lady.